I love Kind bars! I love that they are all natural! I love that they are easy to find, like at Starbucks when I am on the road. I have never tasted a flavor I do not like, and they are a staple for backpacking. A study by the Yale-Griffin Prevention Research Center indicates that eating 2 KIND bars each day helps maintain your weight through low glycemic, deliciously satisfying, nutritionally rich ingredients that will keep you fuller longer. Of course, the chocolate flavors are my favorites! No guilt when you enjoy these delicious bars, as they are not candy bars. 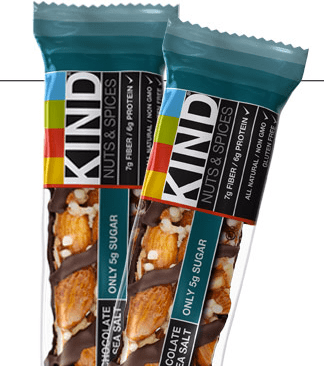 Kind bars are full of good ingredients to keep you going. They are perfect for satisfying that after dinner desire for something sweet or a little pick me up in the late afternoon.